Be sure to check out our Facebook page to view our FUN VIDEOS! 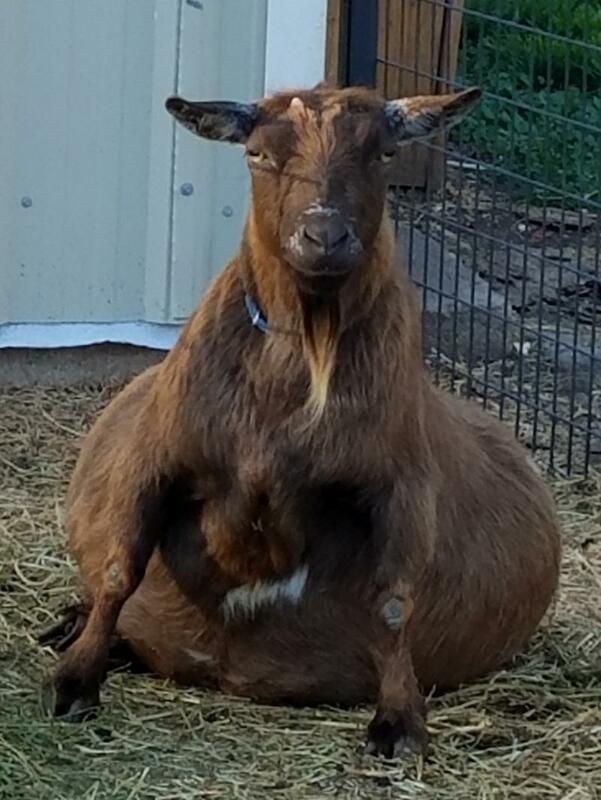 Waiting for her babies to hurry and be born. Mama wants her baby back, who is being tattoed. Our Gorgeous Kingwood Reds! LOVE the dark mahogany red. 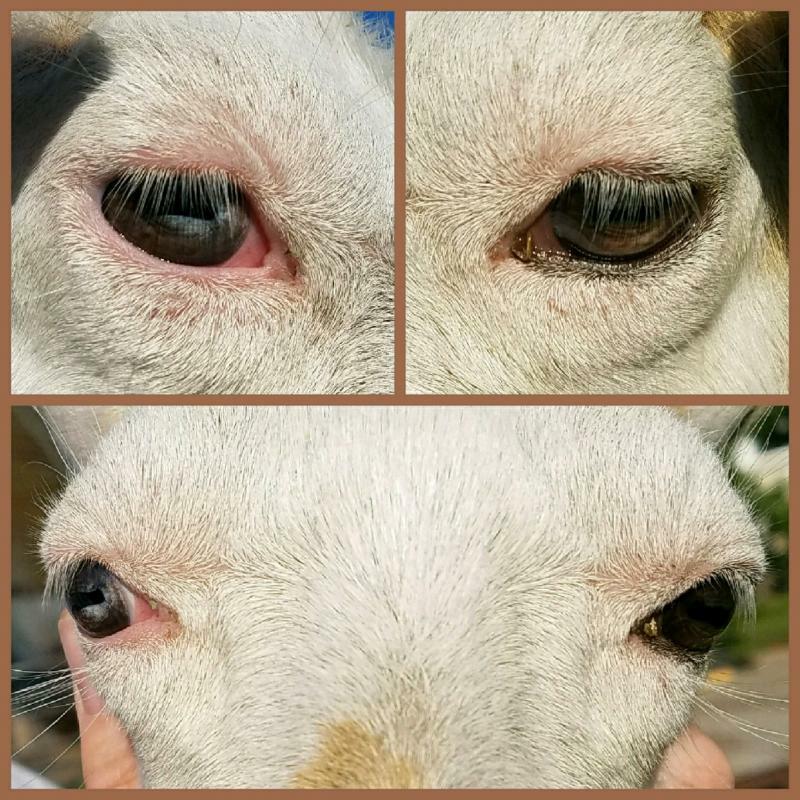 Both mama and son have ice blue eyes. 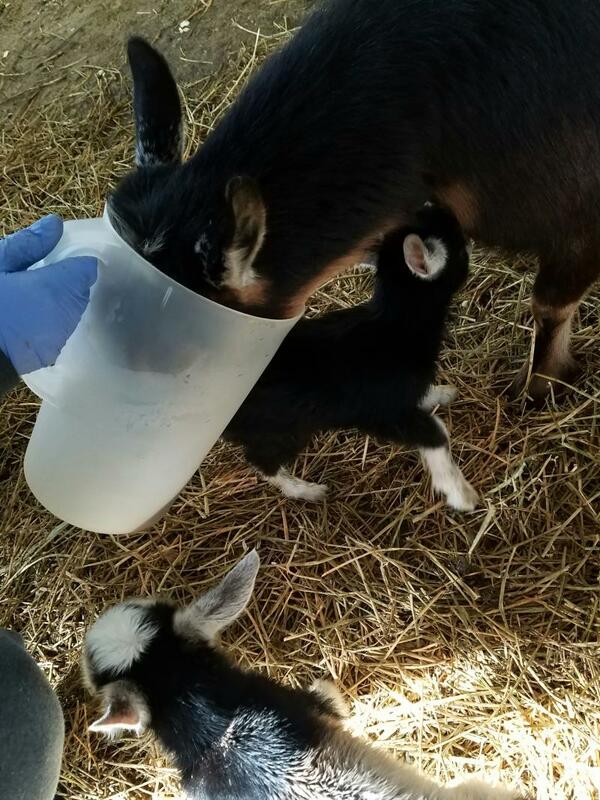 New mamas are rewarded with warm molasses water (a special treat after delivery - also encourages them to take a big drink after all their hard work). Tawnia knew what we brought in for her and didn't want to wait for it to be poured in a bowl. 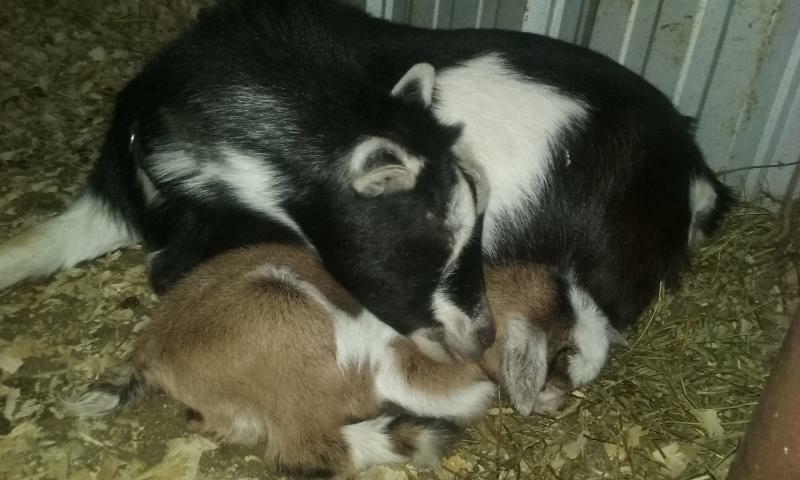 Winslet and her baby girl napping, mamas love their babies. 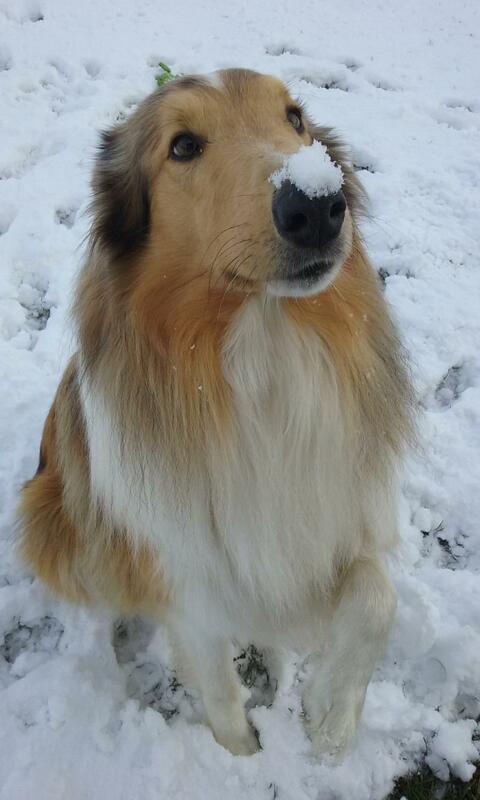 Was playing in the snow, silly dog. He is asking to 'Shake'. 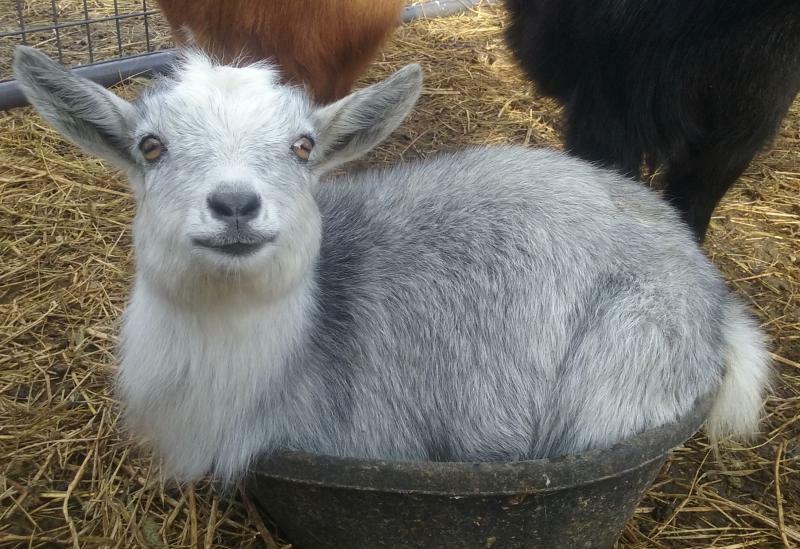 Maggie doesn't want to give up her food bowl bed. 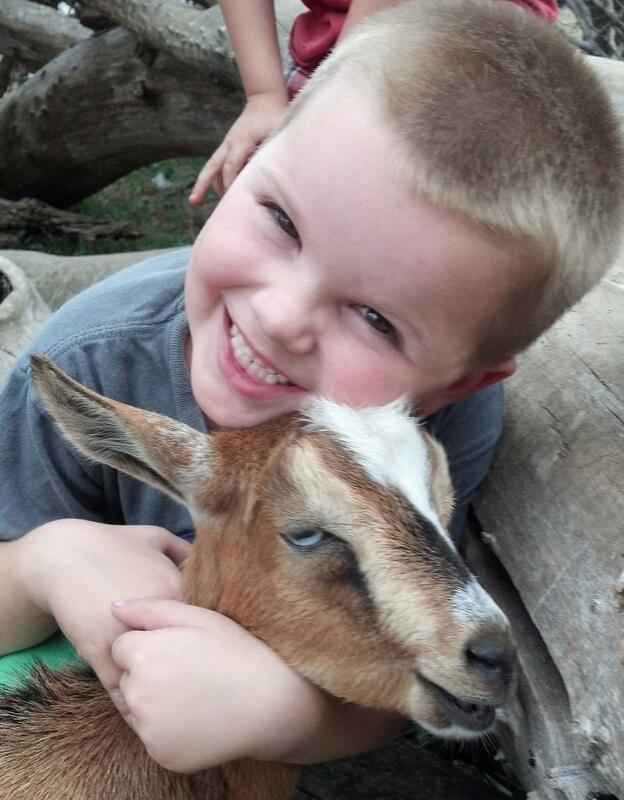 Kids love love love these friendly little goats! 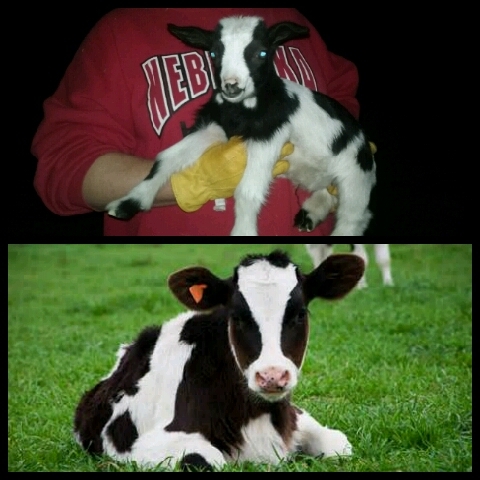 Doodle Bug has always been a favorite bottle baby. 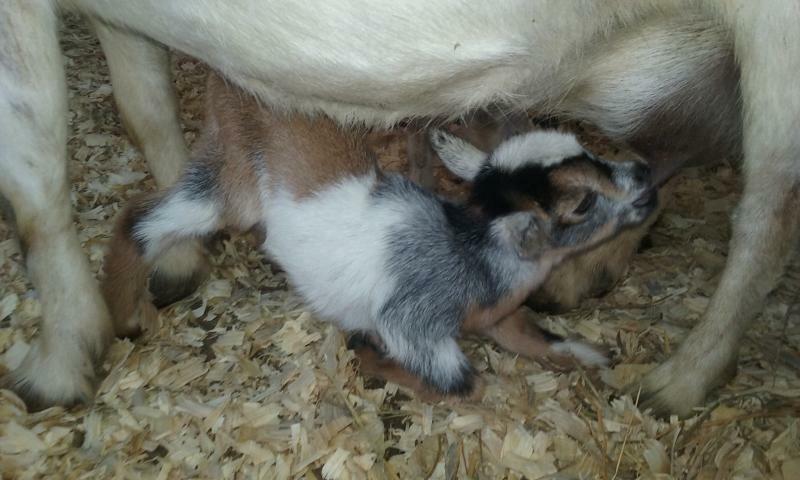 Cricket a doeling of ours, having some of mamas milk. 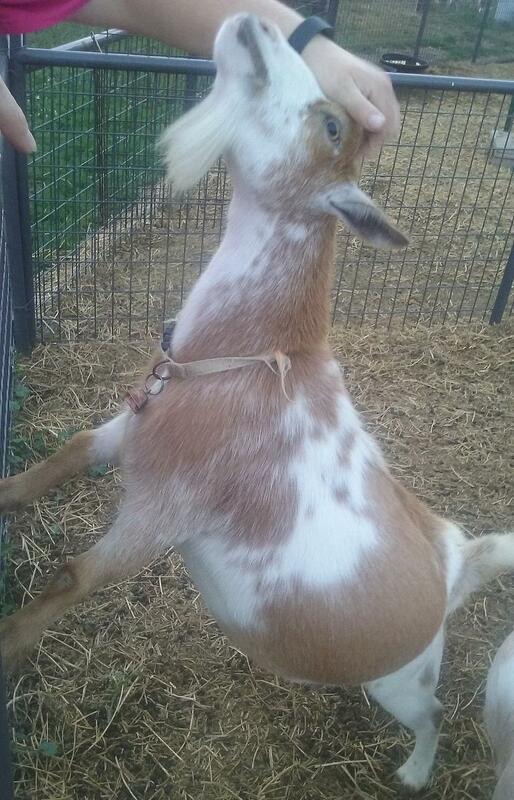 NewSong enjoying a good scratch. A young boy and pup meet for the first time and are immediate best of friends. Pup whined and looked for the boy, then sat right beside him to watch the doelings. I had to get this pic, too cute! 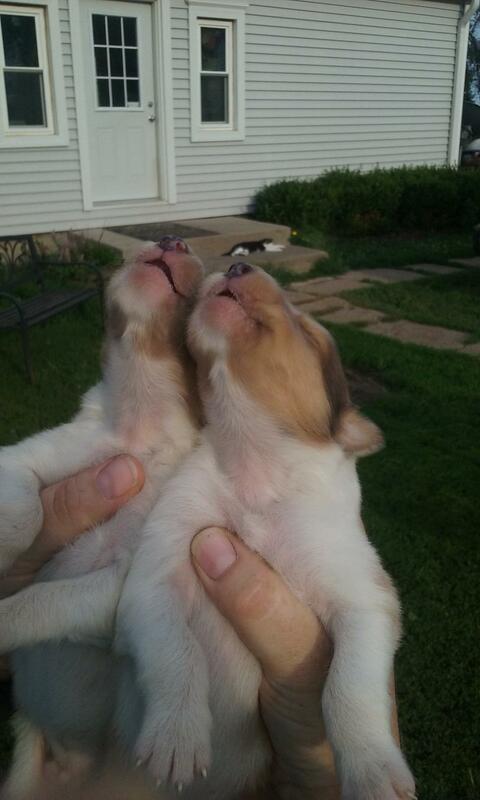 Baby Collie brothers howling in sync. Emmitt Brown and Charlie Brown. (Both these two pups went to family so it was fitting to name them after their sire Sawyer Brown). 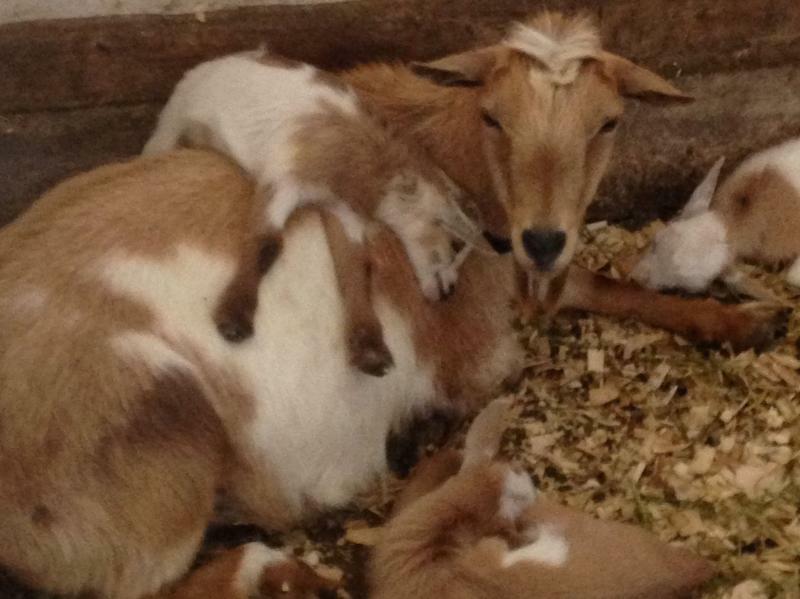 Mamas sure LOVE their babies! 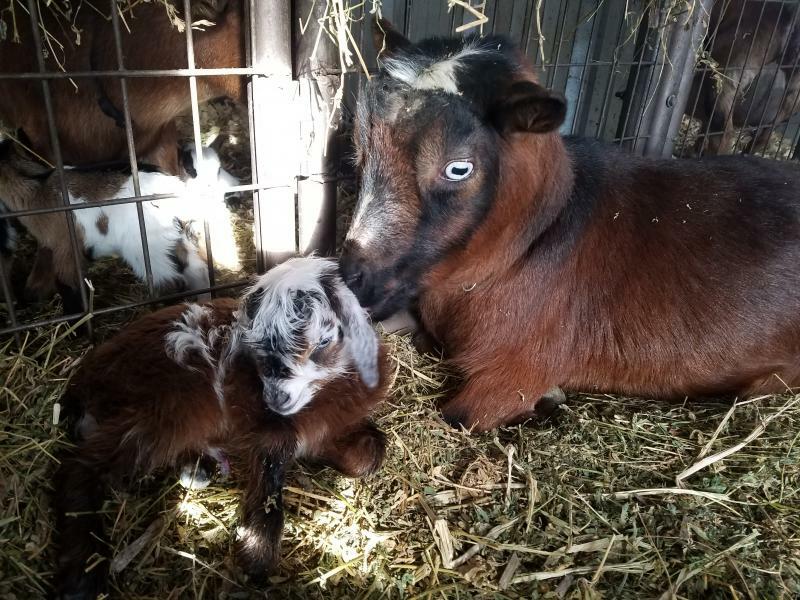 Mama couldn't wait for us to finish dipping her umbilical cord so she could have her back. Sawyer loves to smell all the new arrivals. 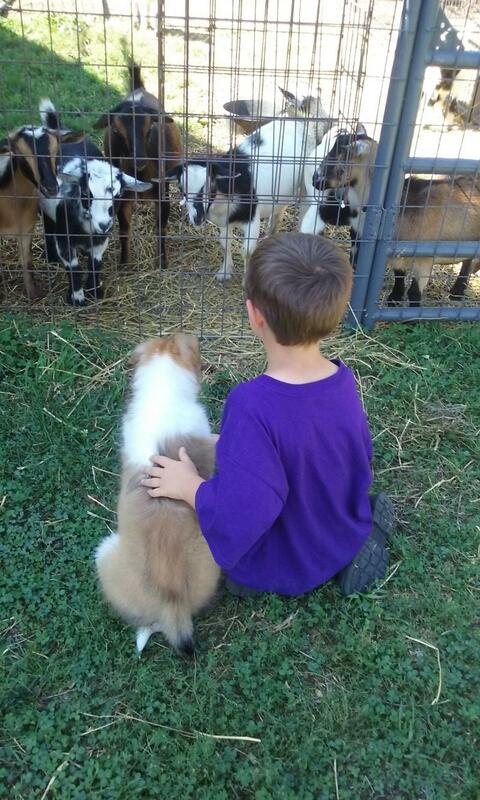 He is very gentle with all the farm animals. Sawyer's favorite, he could play all day. Many visitors get suckered in to playing fetch. Sawyer will find any stick and bring it to someone to play fetch with it, including giant tumbleweed plants that he likes us to remove the branches from so he can have it to fetch. Weighing to see growth. We also weigh for medication dosing. 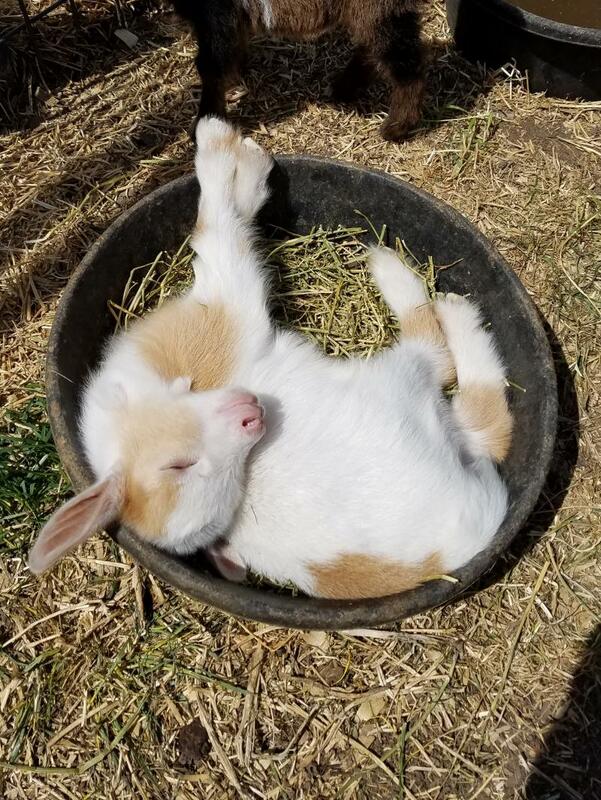 From little on, goats love to make bowls into beds. Super neat looking Marbled blue eyes. 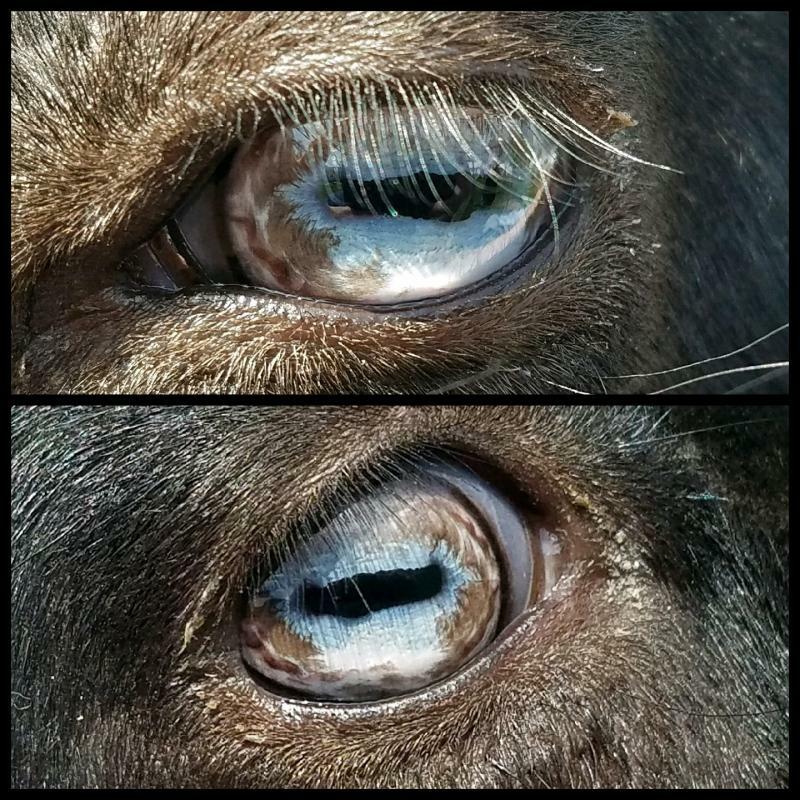 Another interesting set of eyes, brown eyes-but one has a spot of blue. It is thought that he is genetically blue eyed. 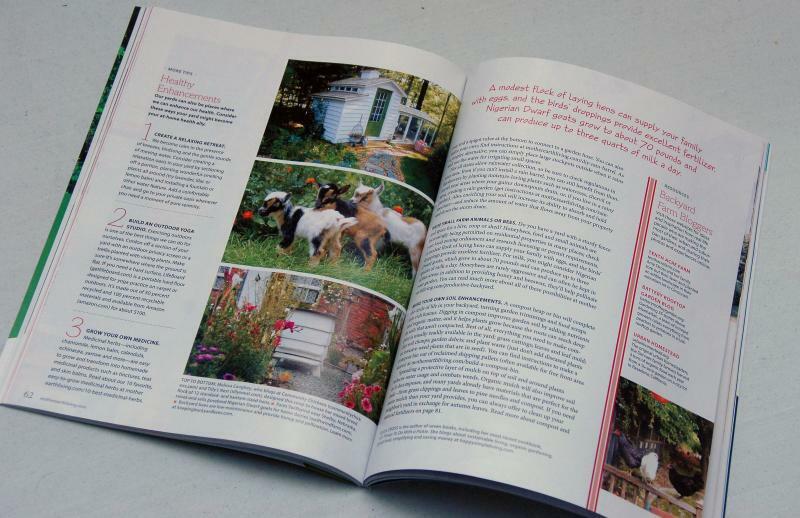 Our farm in Successful Farming magazine Sept 2016. 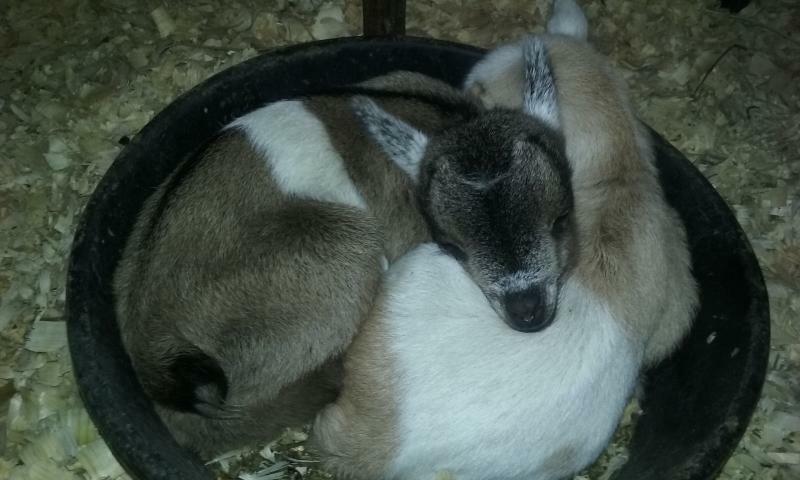 2 sleepy baby brothers snuggling up in a feed bowl. 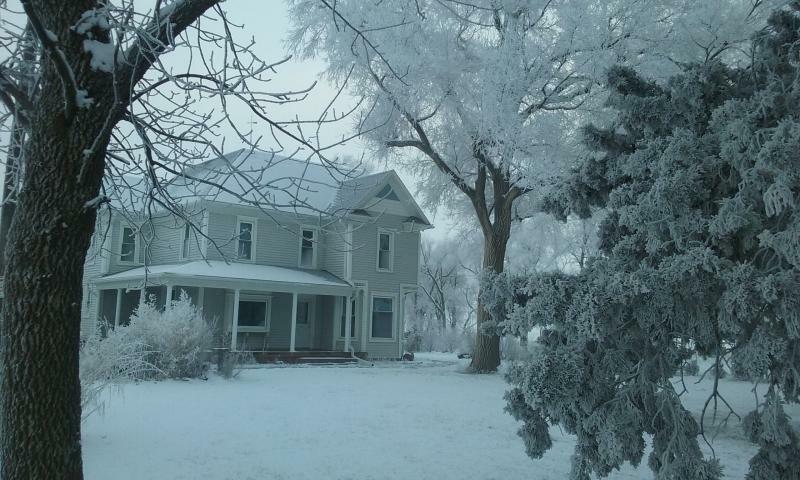 A cold and snowy day --- the 'Mamas To Be' do not want to leave the warmth of the birthing shed unless they have a very good reason to (waiting for the grain cart to come around their way). 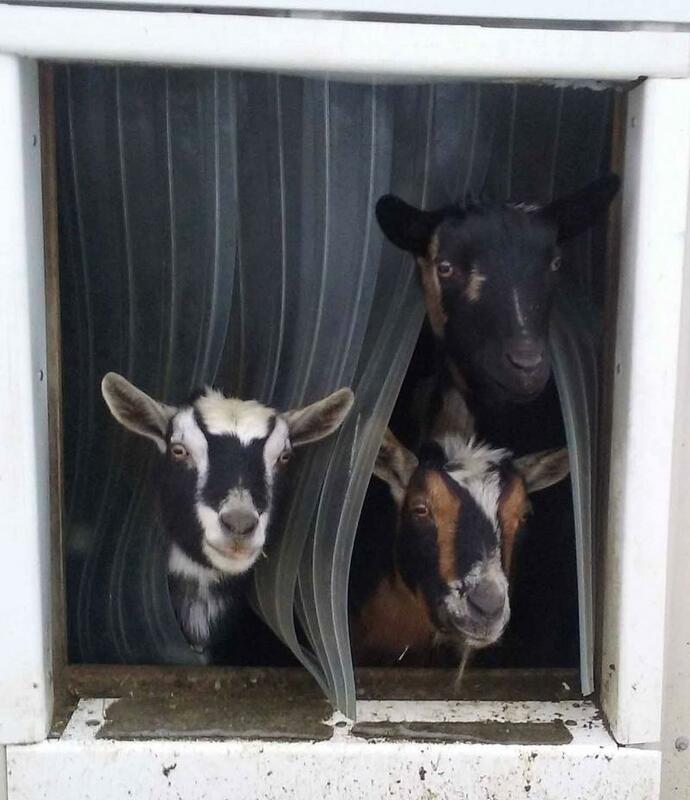 Goats do not like rain or snow. They run for shelter even in a light sprinkle. 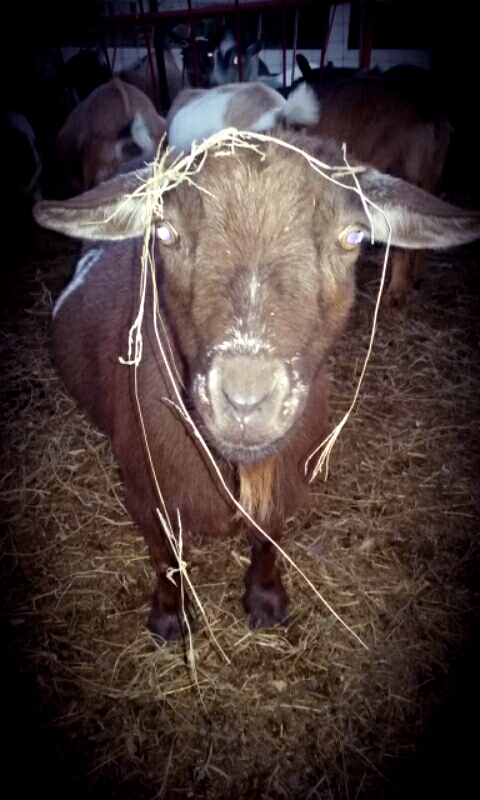 We enjoyed this beautiful white Christmas, but the goats did not and chose to hid in their warm sheds & barns. 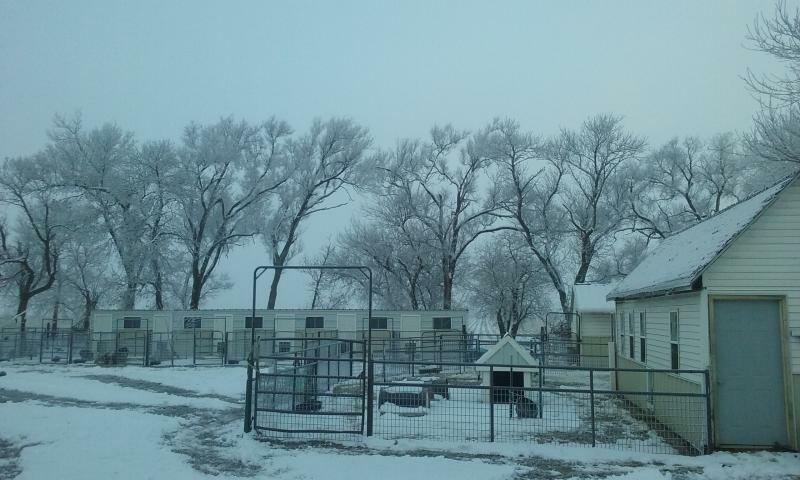 Ours are a bit spoiled and get paths hand scooped or we take the snow blower into the bigger pens to make paths. 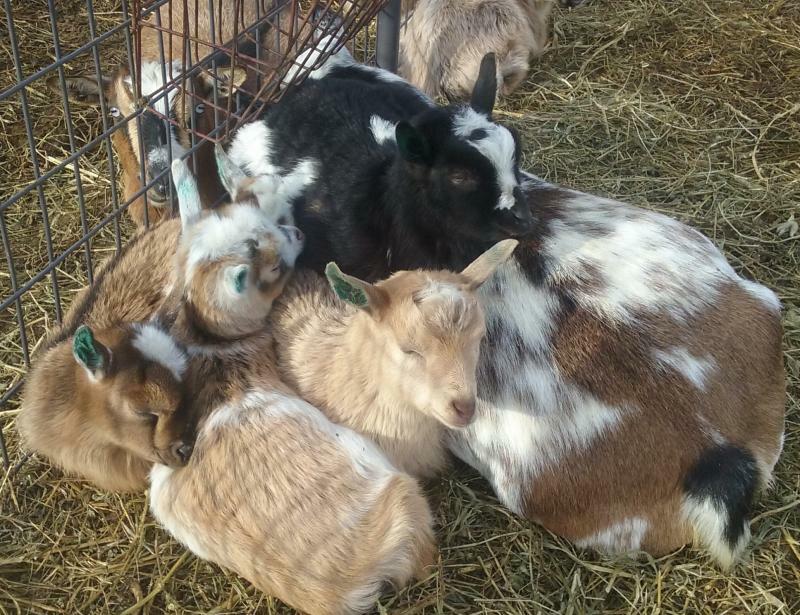 The kids use a mama for a dog pile style nap. Kids have temporary green ears from being freshly tattooed with their ID's. 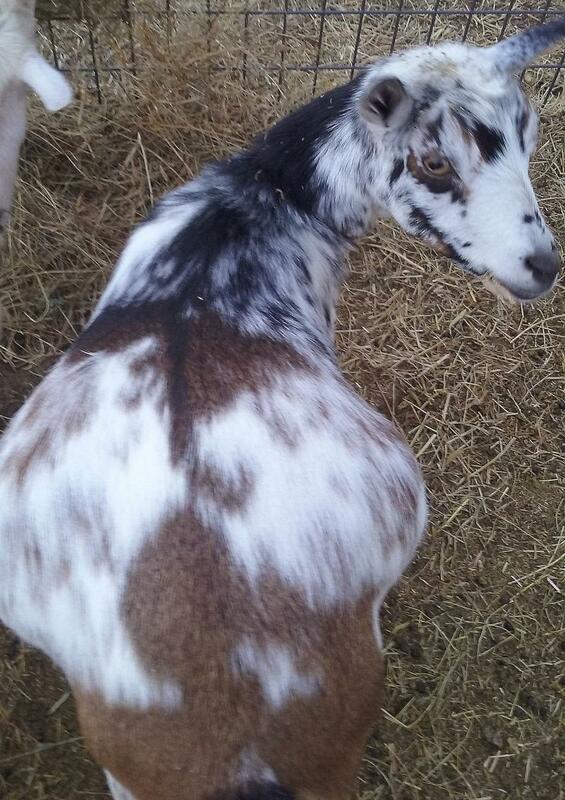 This young buckling totally resembles a holestein dairy calf. Kinda fitting since his granddam was in the top ten in the nation (6times!) for milk production. 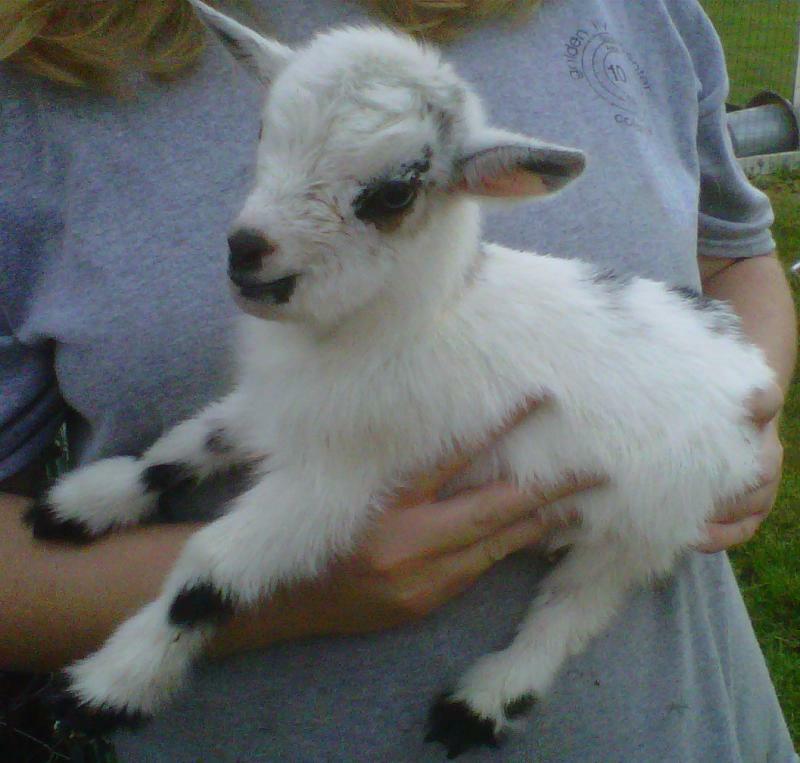 His adorable neck wattles look dipped in milk too. He has an amazing pedigree and will remain here as a future herdsire. 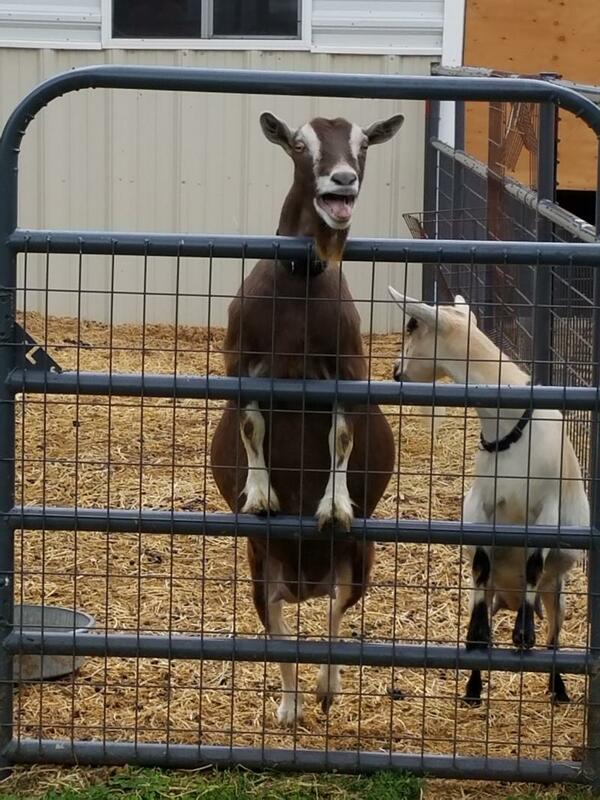 His name is Cowboy. ﻿NewSong rubbing on Diamond Lil. 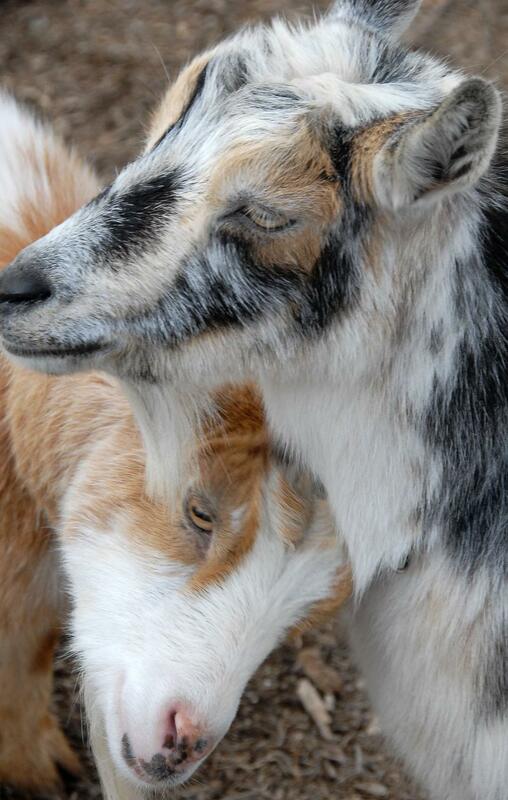 They are herd animals and love the company of other goats. 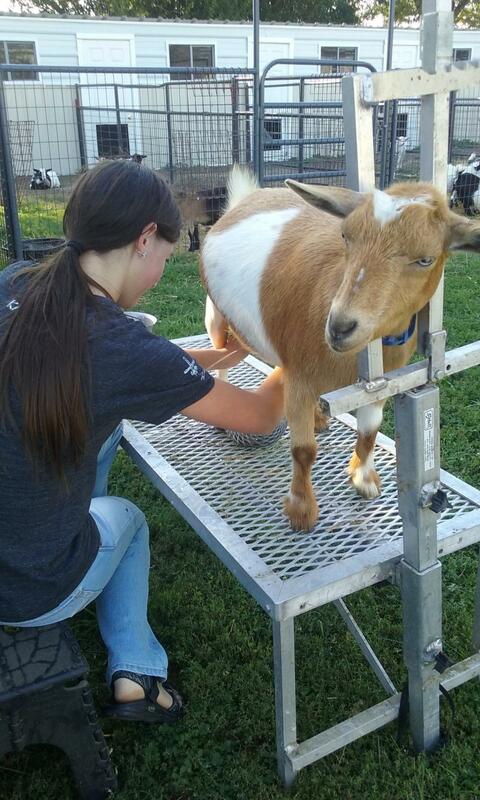 A goat customer trying out milking for her first time. 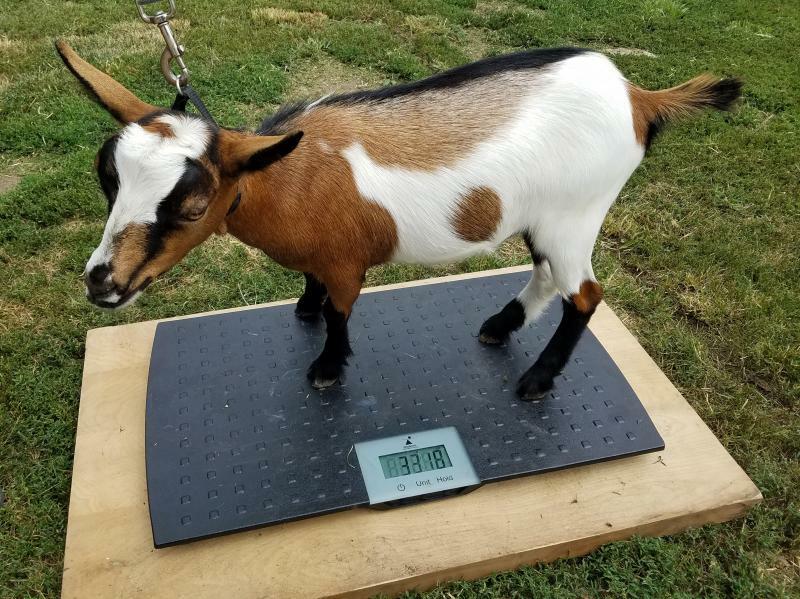 Punkin is an amazing goat who stands perfectly even without a bowl of grain to keep her occupied. 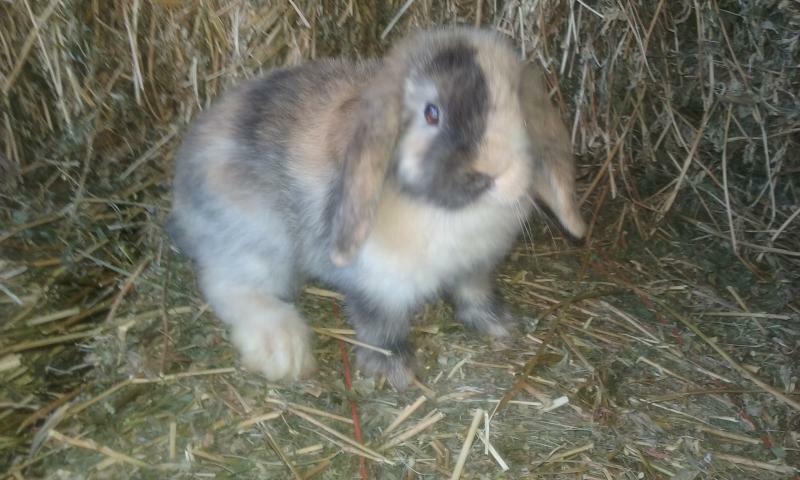 A harlequin color dwarf lop rabbit named TwoFace. 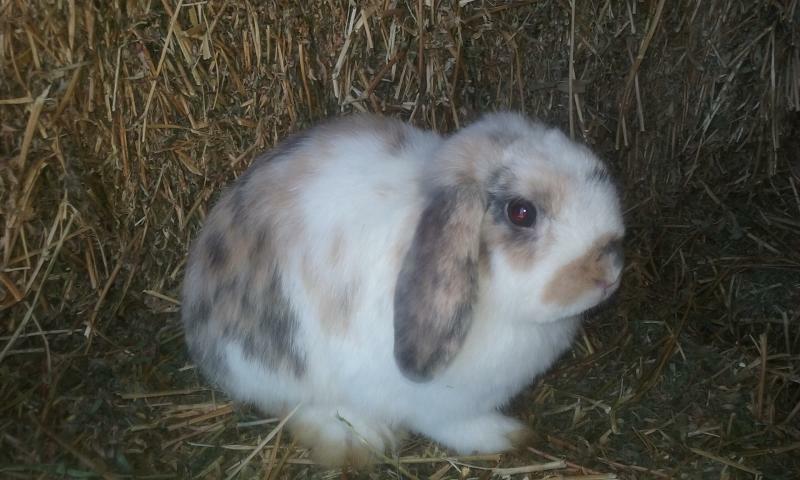 A tri color (calico) dwarf lop rabbit. 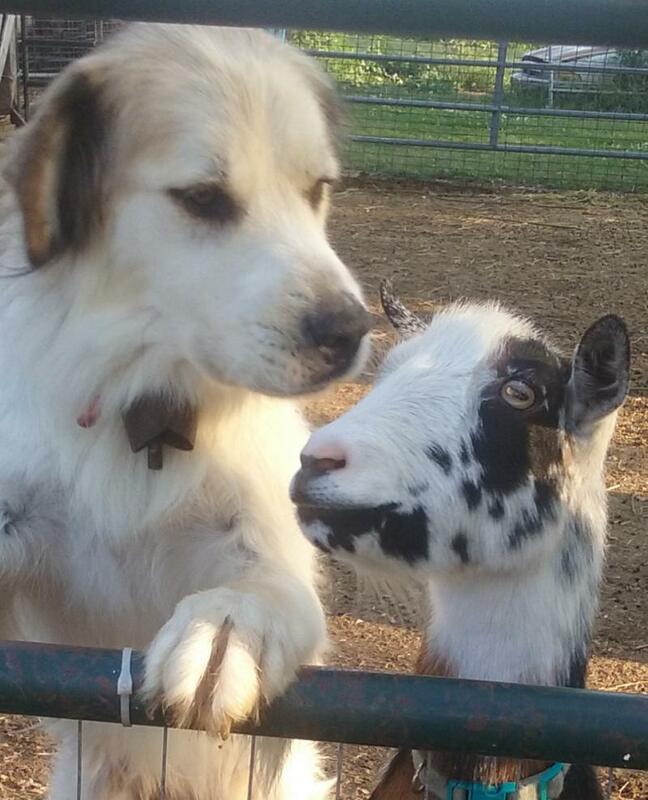 Severus our Livestock Guardian Dog, he lives with the goats 24/7. 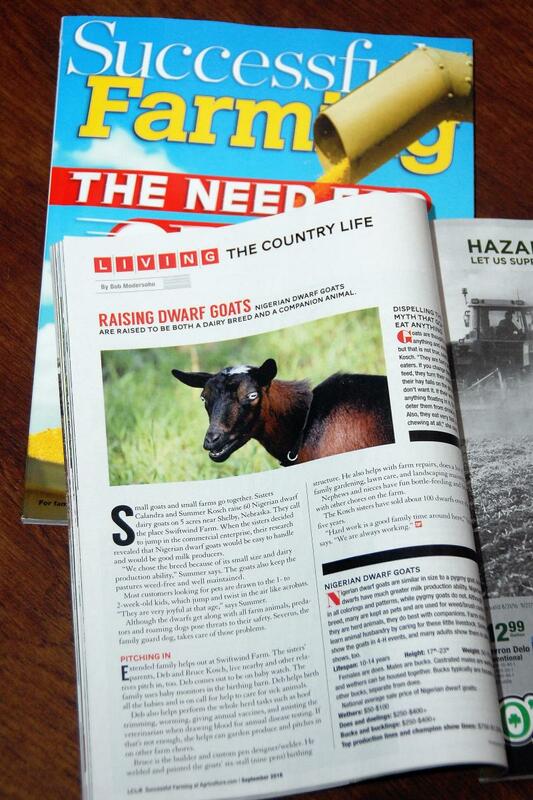 Bebo a herd wether and Severus are best buddies and play together. Sawyer anticipating another game of fetch. 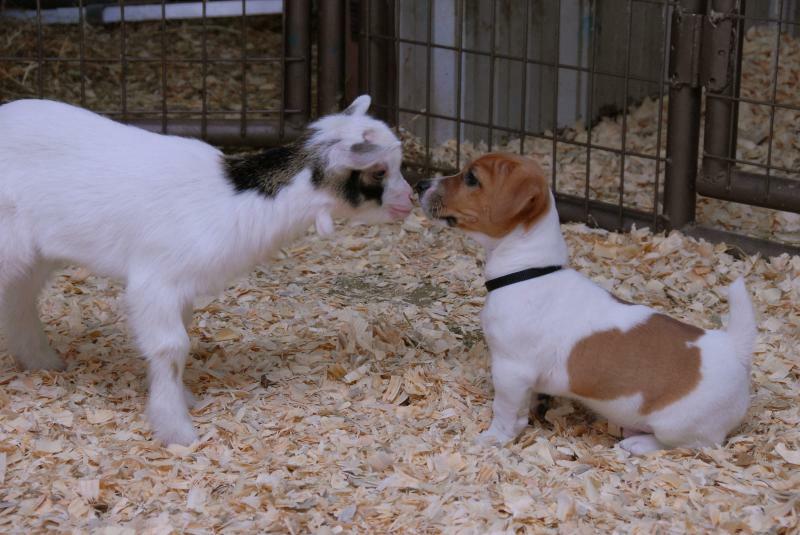 Pup Barkley meeting the goaties for the first time, and doeling Adellabella meeting her first doggie. 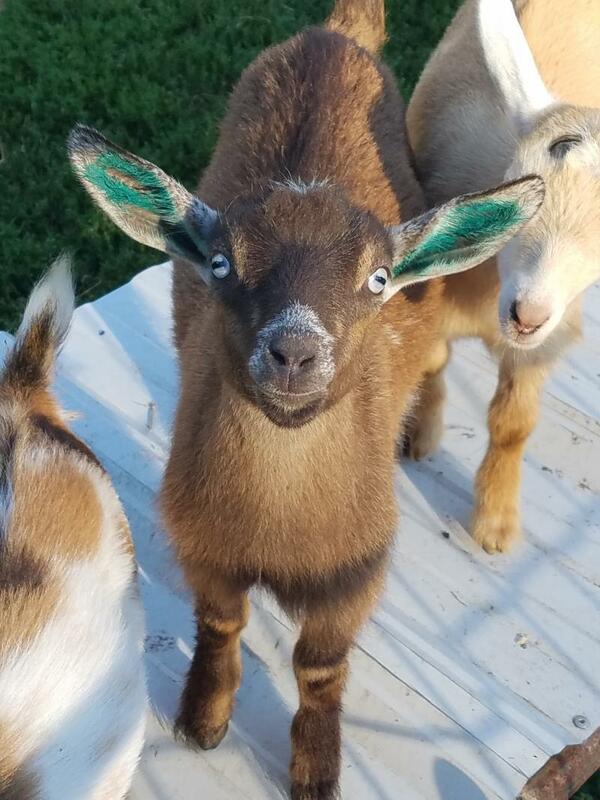 Just a cute pic of Cricket a doe of ours.